Girl has 4 times as much money as Boy. After she gave him $50, she had 3 times as much as he had. How much did he have? Therefore the 4th ---- in Girl "Before" must equal 50 50 50 50 since she gave him 50. I could also write an equation here using the UNIT but I chose not to. Please comment on this crude attempt!! Thanks for taking time to comment on the Singapore model method in solving arithmetic word problems. Your solution to the boy-girl problem looks fine to me. BTW, you may be interested to look at another non-algebraic method of solution I'll be e-mailing to you shortly. And your concern as to whether your solution may appear quasi- or pseudo-algebraic isn't uncommon even among problem solvers who are versed with the model or bar method. In many ways and instances, the model heuristic is nothing but algebra in disguise. Instead of using the variable x, we use a unit, part or line to represent some unknown quantity. It's probably not a white lie to say that in a number of modeled solutions, the model method dresses up as some pre-algebraic heuristic in some visual attire. 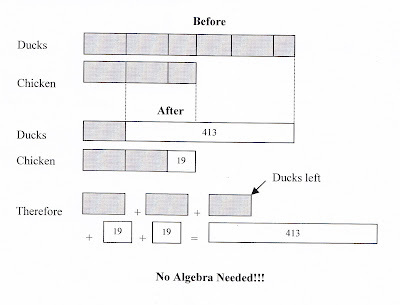 Ironically, this is where the power of the model method lies: It allows us to use visualization to solve higher-order word problems, which would normally be solved by algebraic means. In other words, the model method enables us to solve [including challenging] word problems at a lower grade, when traditionally they're only assigned to upper-grade students, using algebra to solve them. You raised the point about equipping teachers to be proficient in using the model method. Well, believe it or not, albeit the model method has been around for about two decades now, there has never been any formal in-service training for elementary school teachers to learn it the effective way. The heuristic was popularized by assessment writers-entrepreneurs in the late 90s, and through some talks and workshops conducted by speakers not affiliated with the Ministry of Education, SIngapore. In fact, it was only last year that the MOE decided to publish a "monograph" on the model method - apparently to be given as some kind of gift or souvenir to visiting foreign educators, unfamiliar with the heuristic. Most of us learned the model method the hard way, by starting to solve some challenging word problems in assessment titles, either as teachers who have little or no choice but to teach it in schools, or as parents who try to help our children with this visual heuristic. In fact, only in recent years that some lecturers from the National Institute of Education (NIE) had started conducting some interviews and surveys to assess how students used the model method in solving word problems on certain topics. You may wish to look at some papers by Dr. Ng Swee Fong and her co-researchers from the NIE. Thanks to Singapore's enviable ranking in the TIMSS, and to the free marketing by American homeschoolers, the model method is experiencing a second life in our local mathematical landscape. just when we thought we've had enough of it! The math hype here in the last decade has been on problem-solving heuristics (guess & check, draw a table, ...) and thinking strategies, which American math educators seemingly are no longer interested in. Kow-Cheong Yan (@MathPlus) - who is keen to co-write with math educators on the Singapore model method. 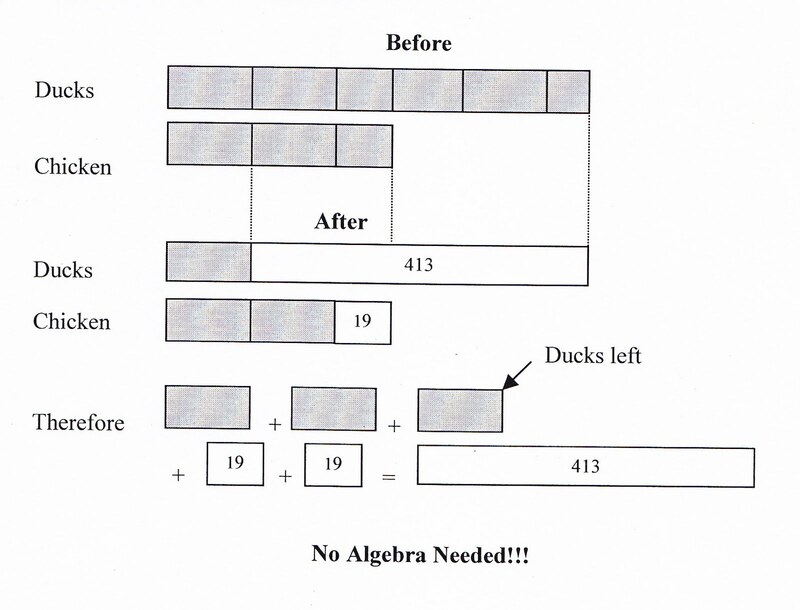 I posted a different strategy that is more pictorial in nature based upon how Jacob's Elementary Algebra introduces problem solving and my own oddball way of doing things. Thanks for the link to your article--I'm passing it on! Thanks for offering a different visual approach to solving the chickens-ducks problem. Another method of solution is never too many to share among our mathematical brethren, especially when it comes to promoting creative thinking in mathematics. One of my readers asked a question about the first statement: "A farmer has twice as many ducks as chickens." Shouldn't that be past tense? "A farmer HAD twice as many ducks as chickens." Indeed, the entire question should be in "past tense." I printed the question verbatim, as it's e-mailed to me a decade-odd ago; besides, I'm not the poser nor the copyrights holder of this Singapore grade four question. I intentionally posted it with all its "grammatical warts."